SEO can be super tricky especially if you’re just starting out. It takes a lot of trial and error before you finally get a win and that usually takes time. In order to combat this and be able to learn quicker, you can actually use Google Analytics as a very useful tool for SEO and marketing strategies. These strategies can further your discovery on how you can maximize the opportunities available for your site. 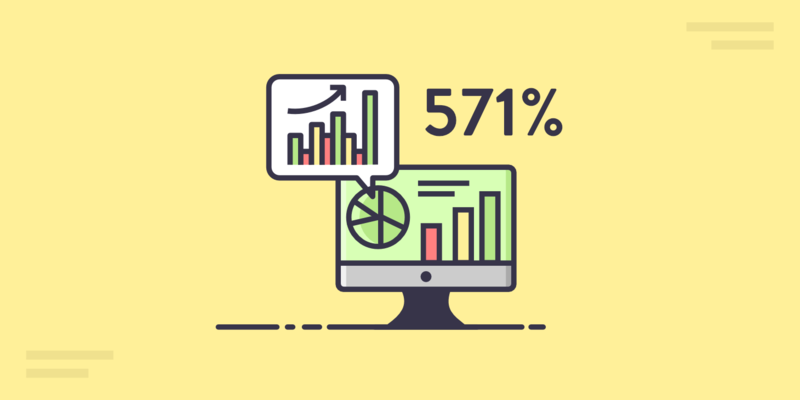 There’s an unlimited supply of knowledge to learn from engagement metric insights to conversion metrics so read on to learn more. 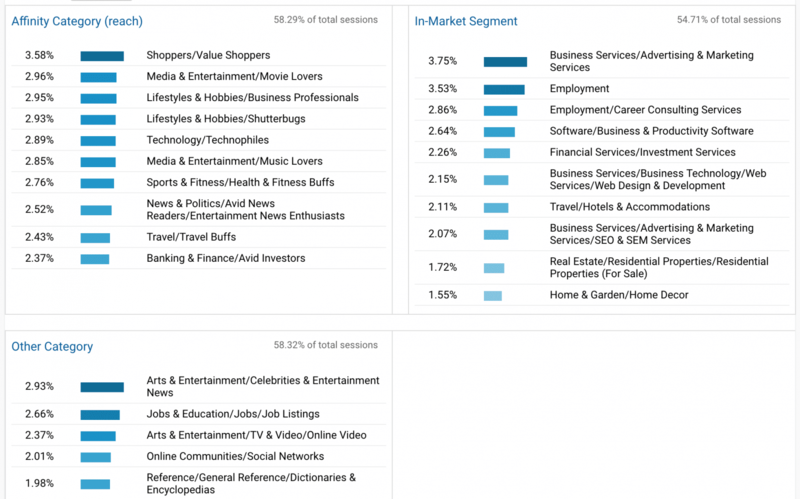 Custom Segments have been around for awhile and has been a key feature of Google Analytics since. It lets you see the traffic per channel along with the visitors who completed goals, demographics and more. These custom segments may be made from basically facet of user data. You can include the visit to specific pages, their time on the site to the visitors from specific locations and much more. In the example below you can that almost four percent of the visitors are Shoppers. Almost 4 percent of them also work or are interested in getting business marketing services. 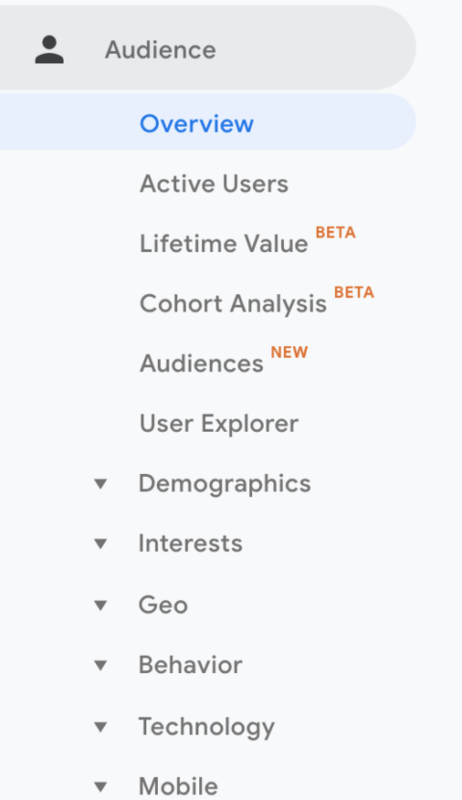 To get even deeper into the analysis, you can go over to Demographics in the Audience tab to see the Age and Gender data. In the example, you can see that most of the visitors are in the 25-34 age range and have slightly more male viewers. From this point, you can create the custom segment to track. Go back to Audience > Overview to view All Sessions. The new segment can be made through selection + Add Segment. It’s here that you will be able to monitor the user behavior, the most frequent visitors compared to the rest of the site. You have to remember to set a time frame of at least 6 months to a year to have a good basis of your data. Mobile traffic is building up in its constantly growing importance. This means that we should go past the simple monitoring of mobile traffic on the site as a general thing. Rather, it’s also quite significant to monitor the amount of engagement levels when it comes to mobile visitors. Look at the rate of mobile conversions per individual page. You can do it via addition of a mobile segment. Compare the difference in mobile and desktop bounce rate metrics. When you do this for the exact same page, you will be able to learn more about the difference of the user experience among the two. If you have a search bar on your website, this can be used as a great learning opportunity. This can let you into what your visitors are looking for when they visit your site. Past what they are searching for, you can also gain insight on how much of them are searching. You can analyze this information. If a big chunk of the traffic on your site is using the search bar then there’s a big chance that the main page needs to be improved. You can edit it towards providing what the users are usually searching for to give them a better idea of the location of their search. The exact search terms they are using in the bar may also aid you in learning about content ideas. This means that if the user is usually searching for a term that your website is lacking in. It would help to create more content related to that. This would benefit both you and the user. While you are able to grow attention to your site, you are also able to help the visitors more. At the same time, when more users are searching a particular topic more, you can feature this on your homepage. This indicates that more people are interested on this topic. They will be able to find it easily onto your site lessening the chances of a high bounce rate. The bounce rate of a website is the amount or percentage of visitors who go to your website then leave after only seeing one page. Depending on the type of website you have, this may indicate that the users didn’t find what they were looking for. This varies of course when it comes to recipe websites people only view that exact page normally. You can rank highly for a long-tail term but once the person arrives to your site, they don’t see that content. This will make them think that there’s nothing helpful for their query so they leave. The usual cause of this is a poor UI/UX and also a hard to manage website design. You can change your time frame in Google Analytics from quarter to quarter to better assess you bounce rate. You can determine from here if this has increased or decreased. If it has heightened noticeably then you may need to update or change something on your site or that particular page. Once you understand the performance and conversion of each individual page, these can immensely help you in your SEO journey. 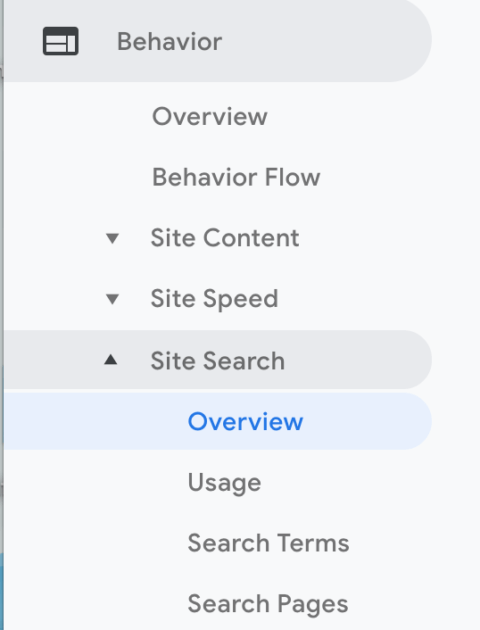 Go on to Behavior > Site Content > Landing Pages and change the time period so you can compare the quarter-over-quarter or year-over-year. You can also see the negative trends that are on each page. If you see that a specific page has a significant decline, the problem is most likely just existing within that page. At the same time, if the decrease can be seen among several pages, this may mean that you have technical issues you still need to improve on. Hope you found our tips helpful as you work on creating that amazing website of yours and we wish you luck on that journey. If you feel that you need more help and you want to learn more about SEO, feel free to contact us here and we’ll be here to help you every step of the way!